Hanging flower baskets, potted plants and flowers make up the beauty of this outdoor market stall at the Byward Market in the city of Ottawa in Ontario, Canada. The sun beats down on the blossoming flowers as visitors mingle about searching for the right display, this being one of the best places to buy fresh flowers. Across the aisle another market stall sells bright colored clothing as the flags on the building blow in the gentle breeze. The Byward Market has a wide selection of boutiques, galleries, cafes, restaurants, craft and art stalls, all which brings in the hundreds of visitors who browse the market. 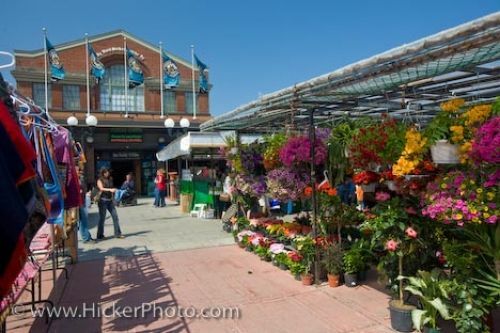 outdoor flower market at the Byward Market, City of Ottawa, Ontario, Canada. Picture of the colorful flowers at the outdoor flower stall at the Byward Market in the City of Ottawa, Ontario.